It's been so hot here in southern California none of us want to be cooking. Here's a great meal that can be prepared outside. Believe me when I say it's incredibly delicious! Sent to me from my good friend Andy, who should be famous for her easy and yummy recipe! Defrost frozen shrimp in a bowl of cold water for 15 minutes. Meanwhile drain pineapple reserving 1/4 cup syrup. Cut mushroom caps, green and red peppers into 24 pieces each. Assemble skewers. Combine melted Smart Balance or butter, pineapple syrup and garlic powder. Baste as you grill 10-15 minutes on medium. Heat and use remaining mixture for dunking. 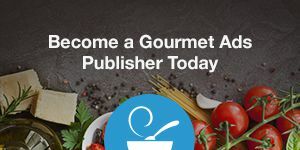 advertising campaign with us, please contact the sales team at Gourmet Ads.